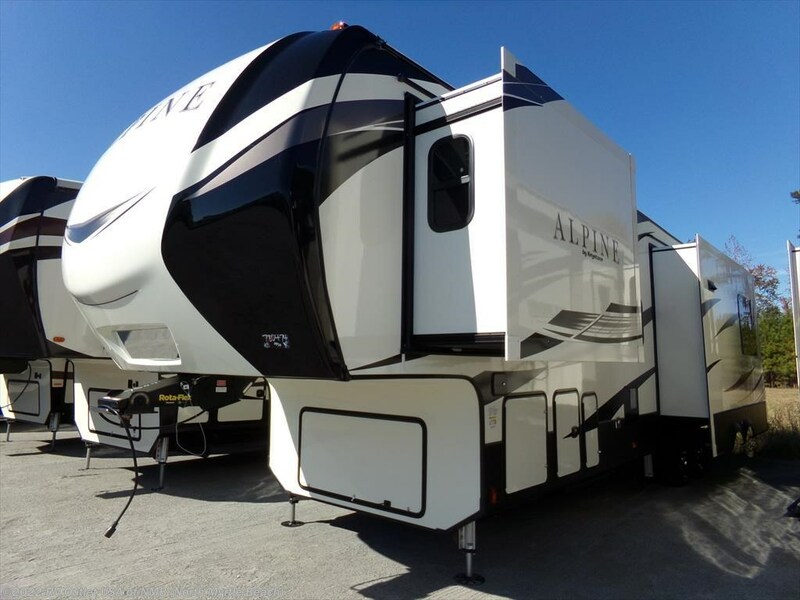 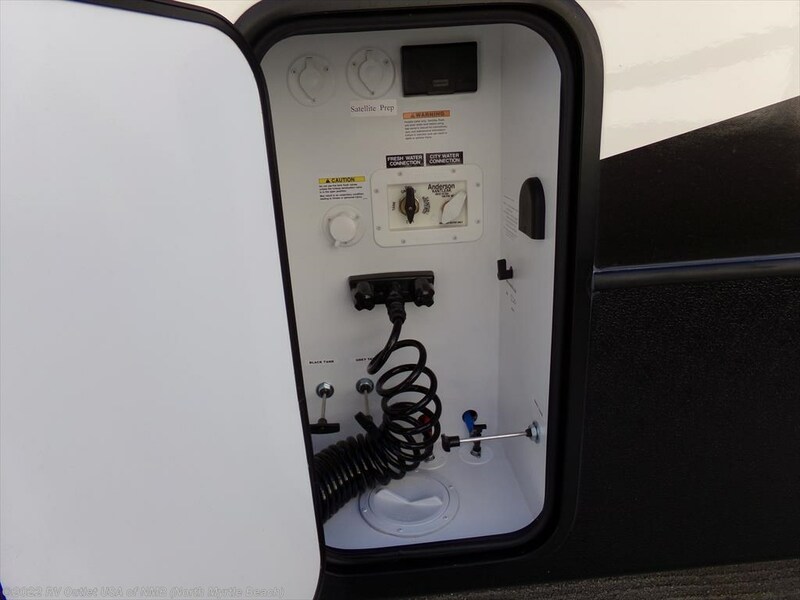 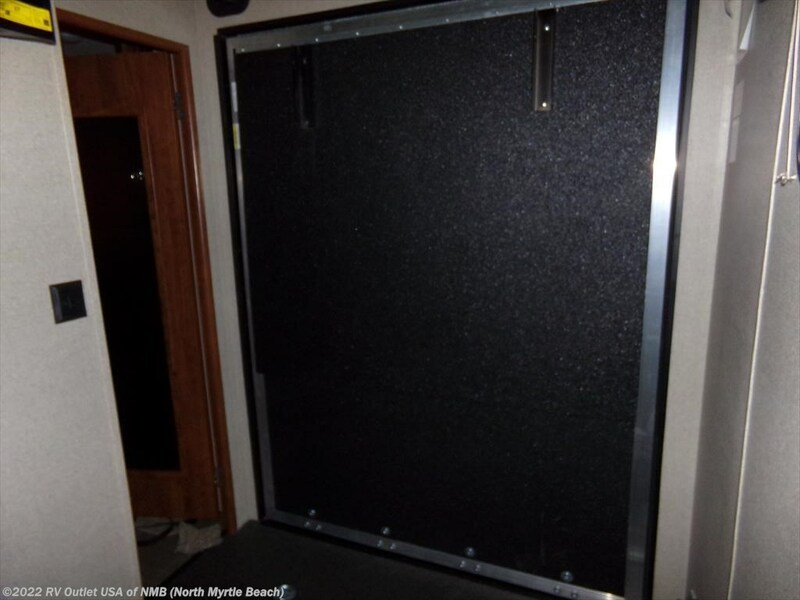 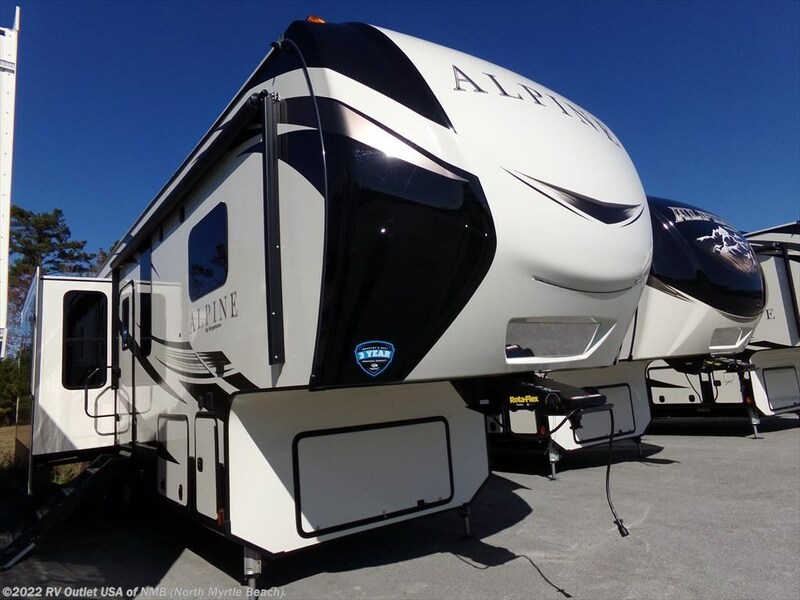 If you’re in the market for a high end, rear cargo fifth wheel, with a ton of bells and whistles, then you really need to take the time to look at this brand new 2018 Keystone Alpine 3901RE that we just got in. 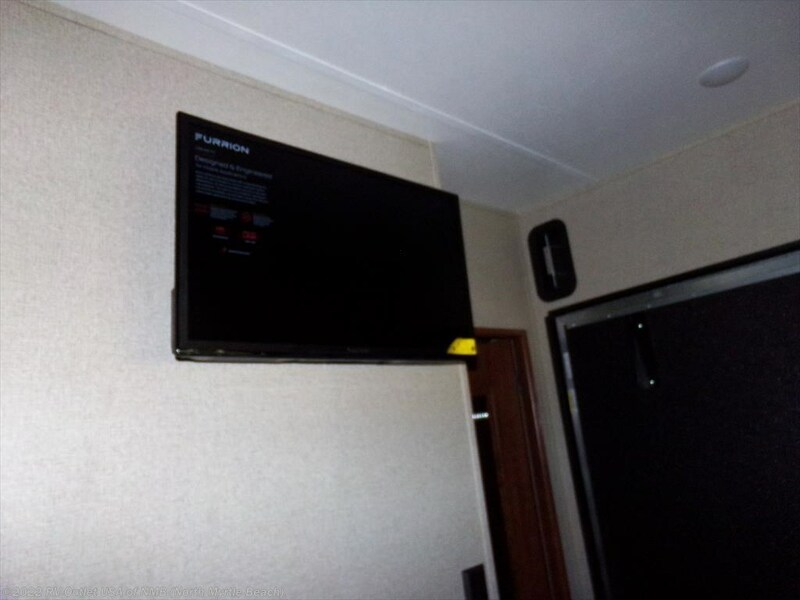 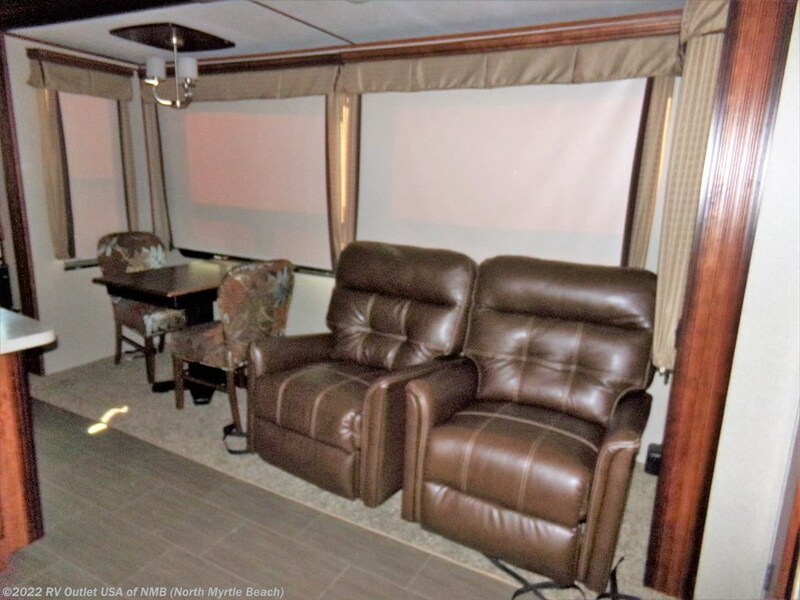 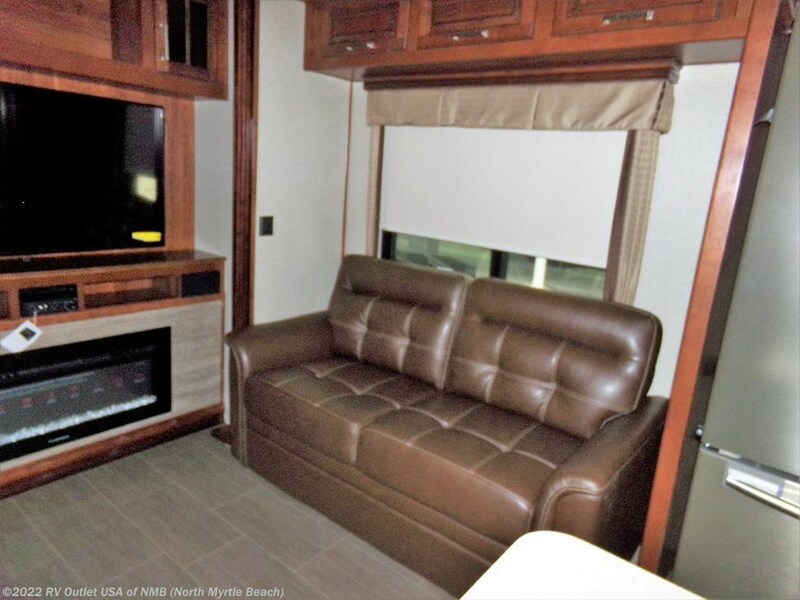 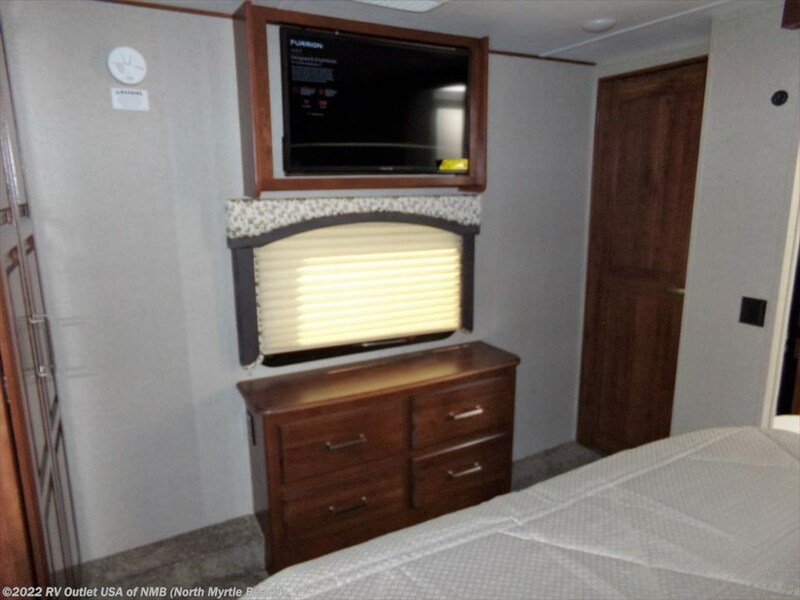 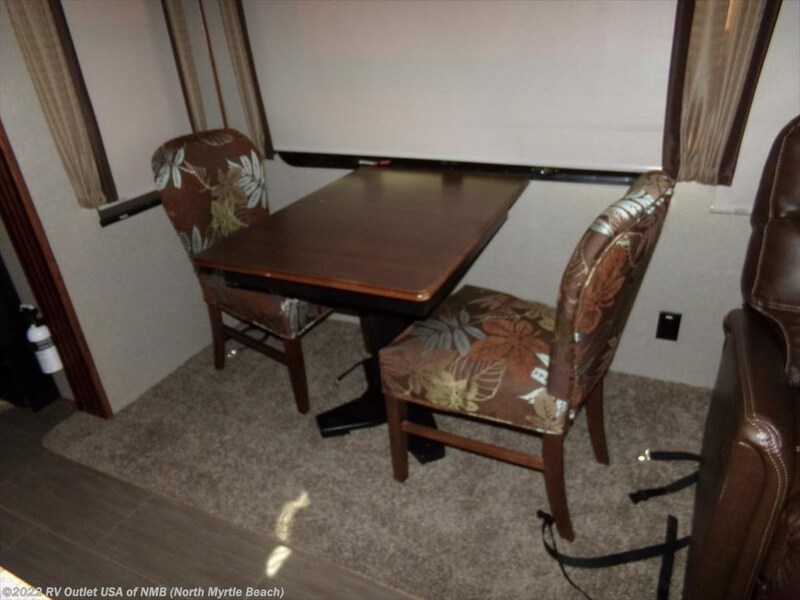 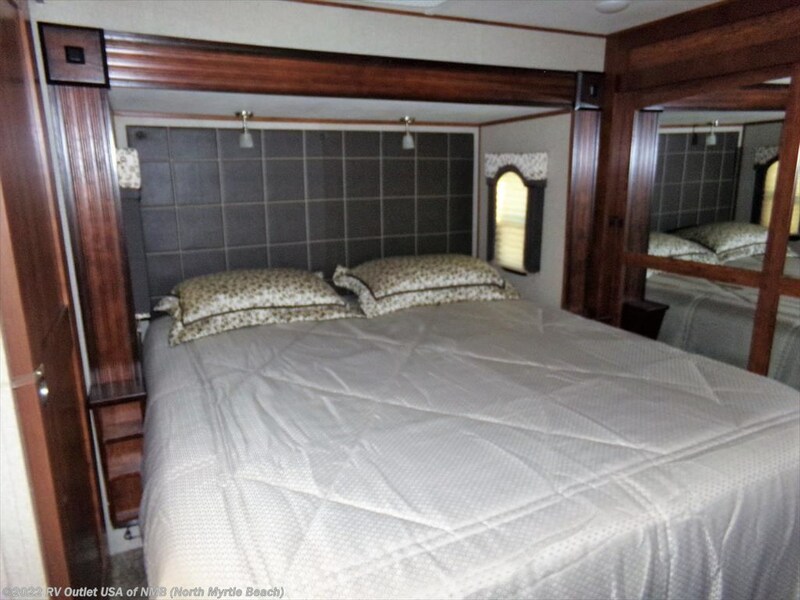 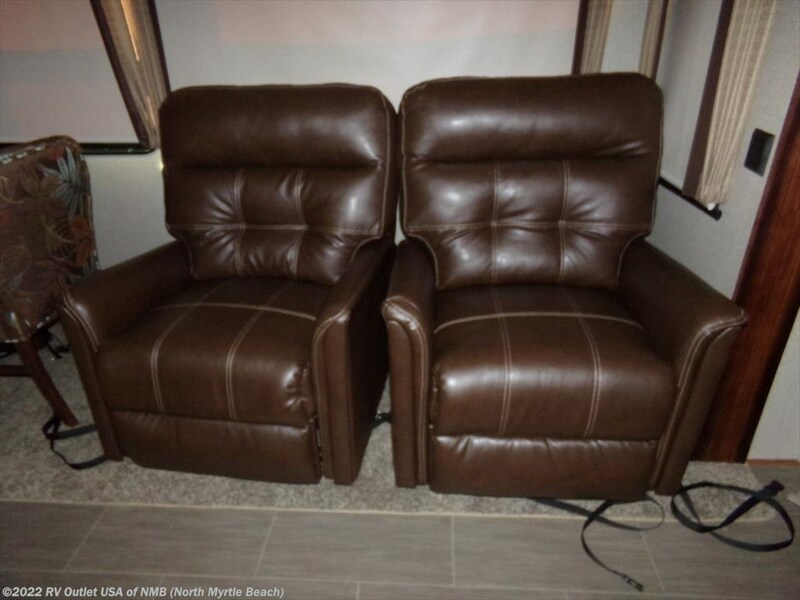 This coach has (3) slide outs with two opposing slides in the front living area one has a tri-fold sleeper sofa and the other has a free standing dinette with four chairs, the entertainment center that has a LCD TV, and a fire place is on the rear wall. 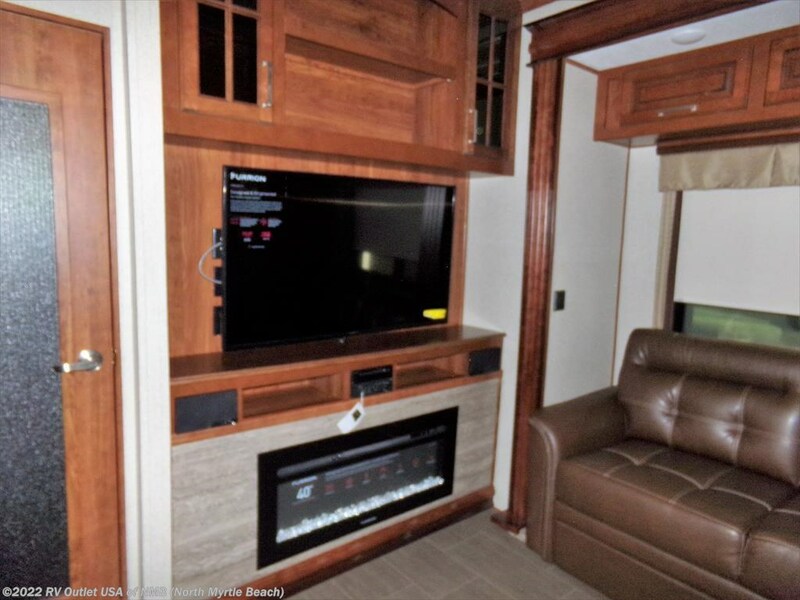 On the other side of that wall is the bonus room that has a flat screen TV, work bench and plenty of room for your motorcycle, bike or any cargo you like. 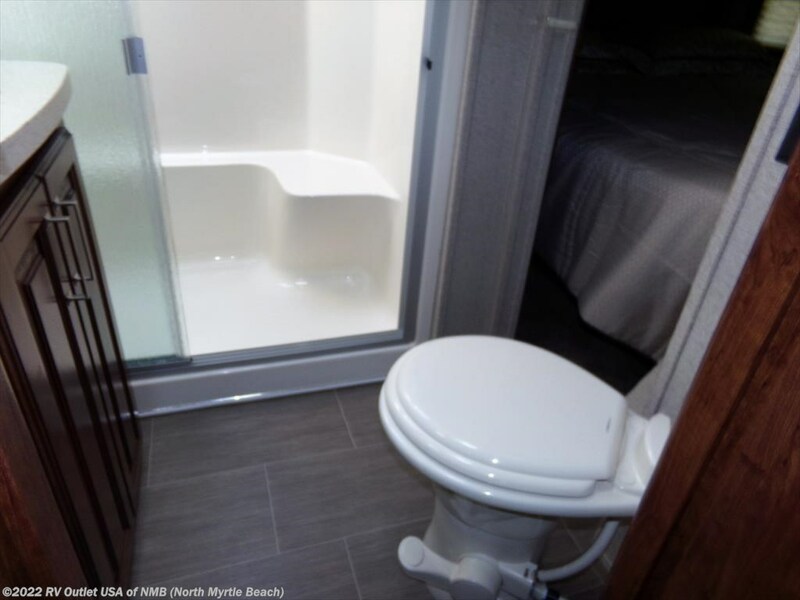 This room has an easy load drop down ramp door as well. 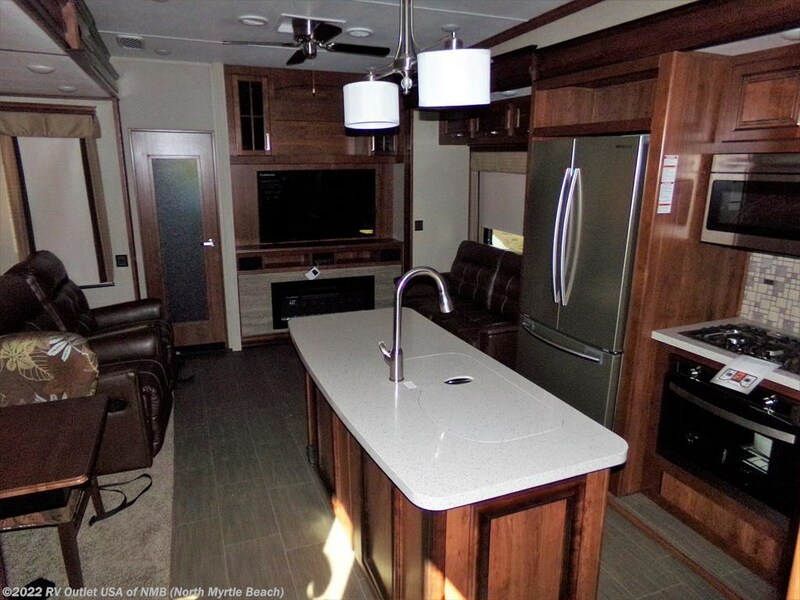 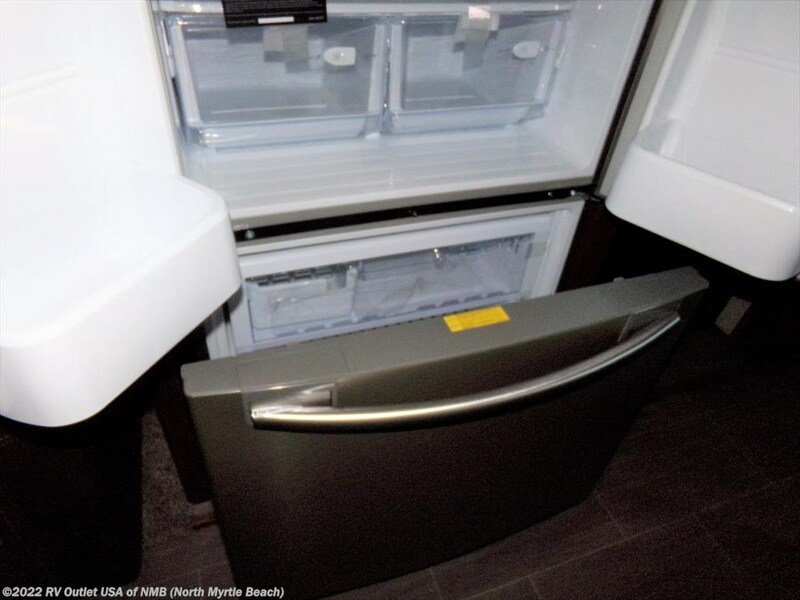 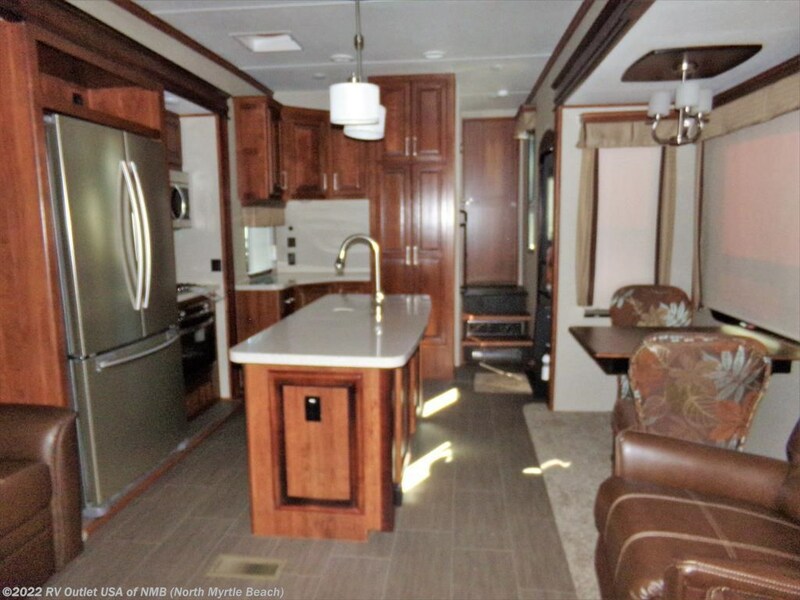 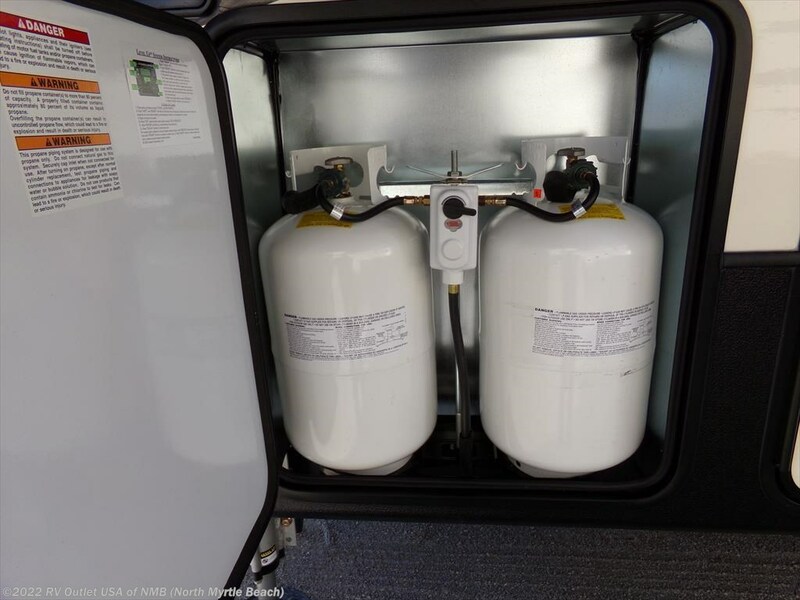 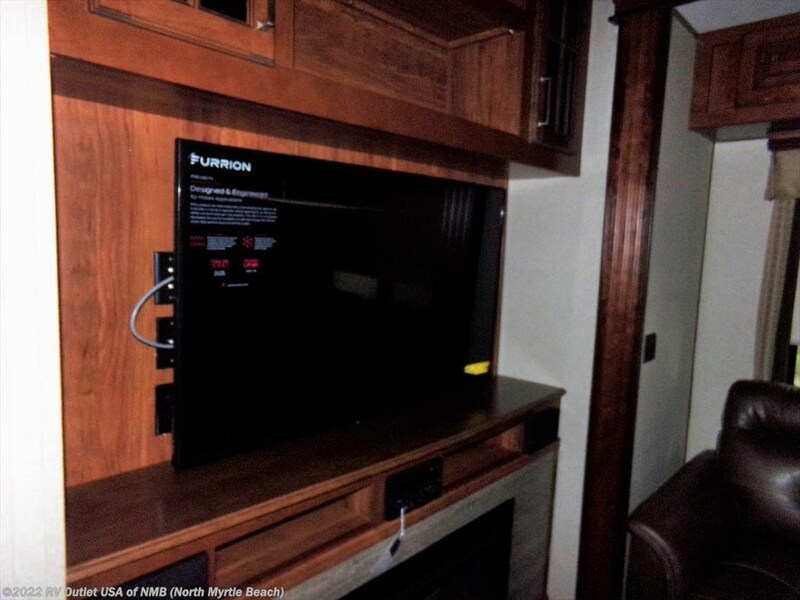 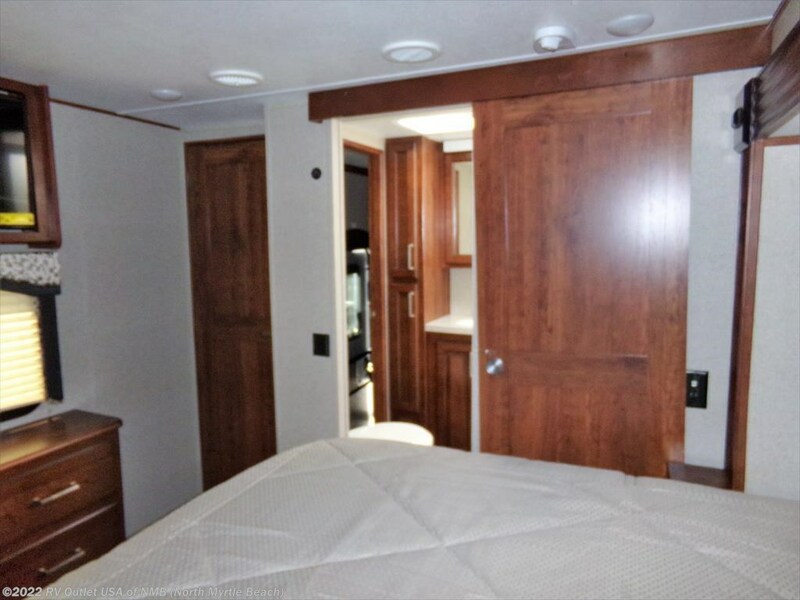 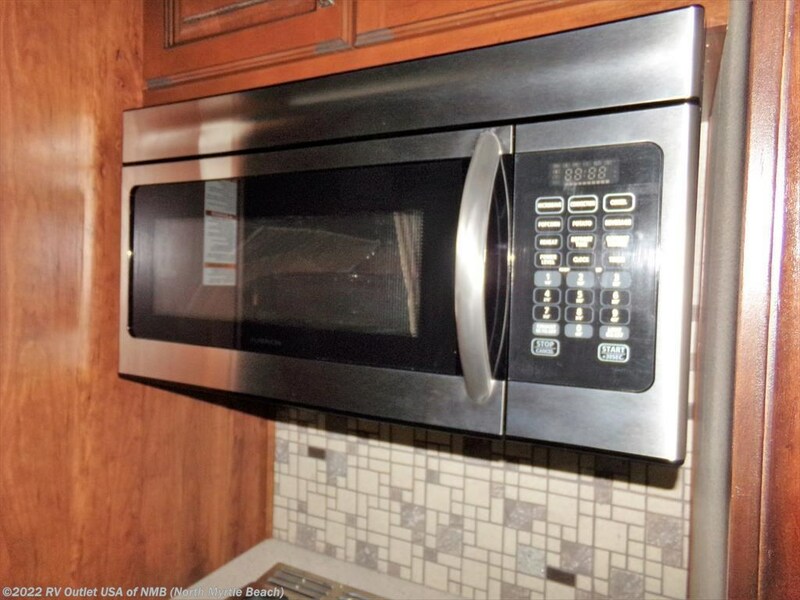 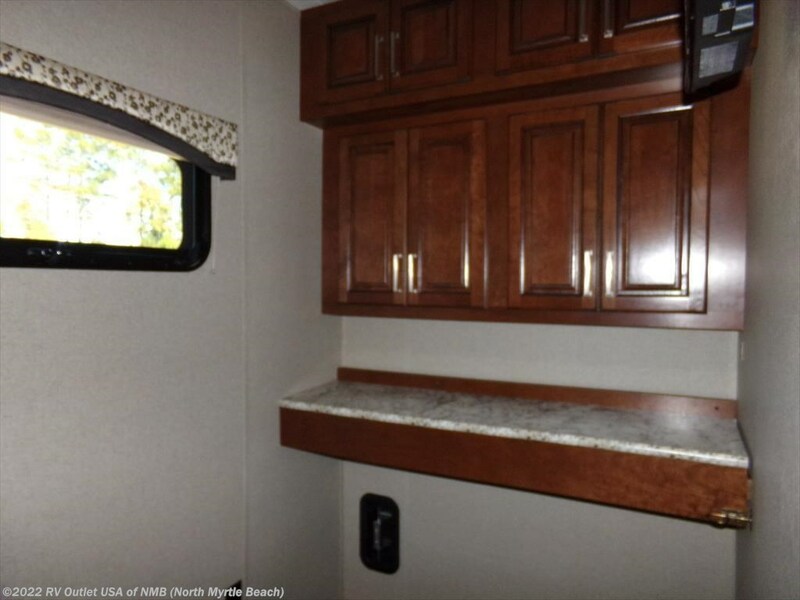 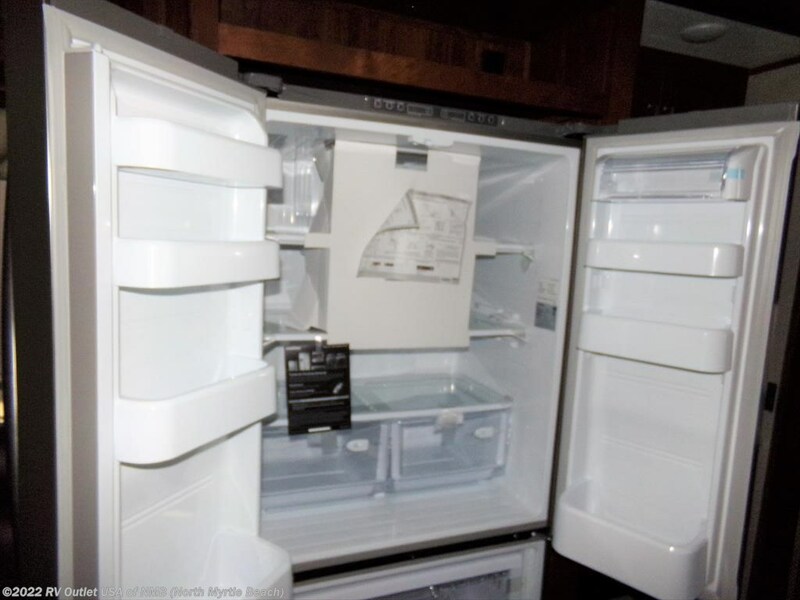 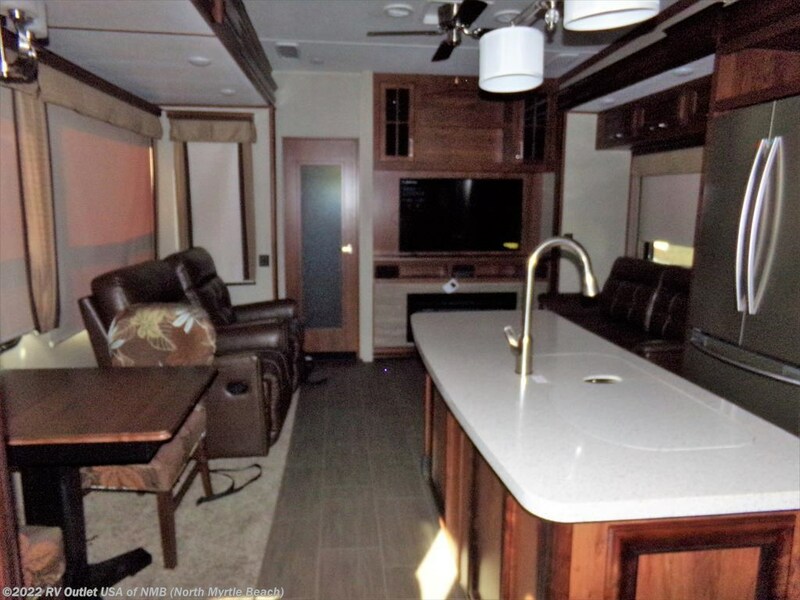 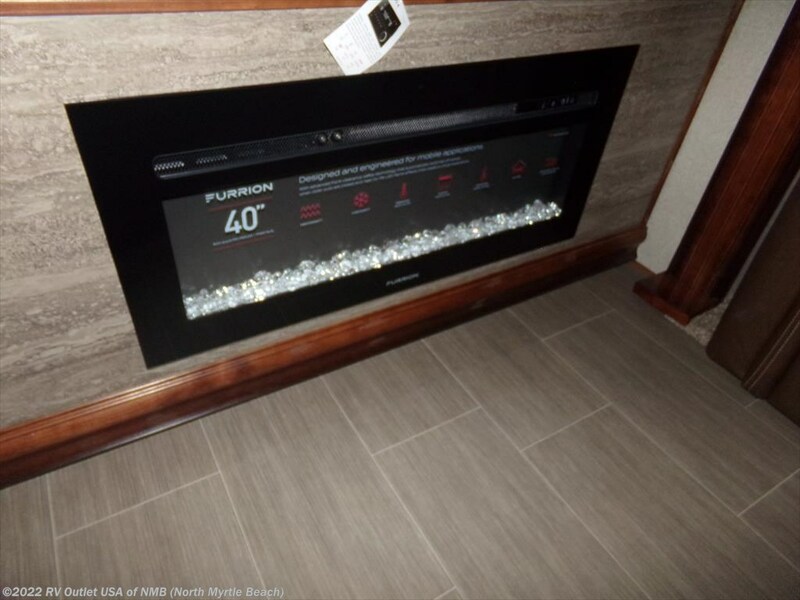 Walking to the center of the coach, it has a galley slide on the off door side within 18 cu ft four door refrigerator, a convection microwave oven, a three burner high output stove top with oven, overhead cabinets and underneath cabinets for storage. 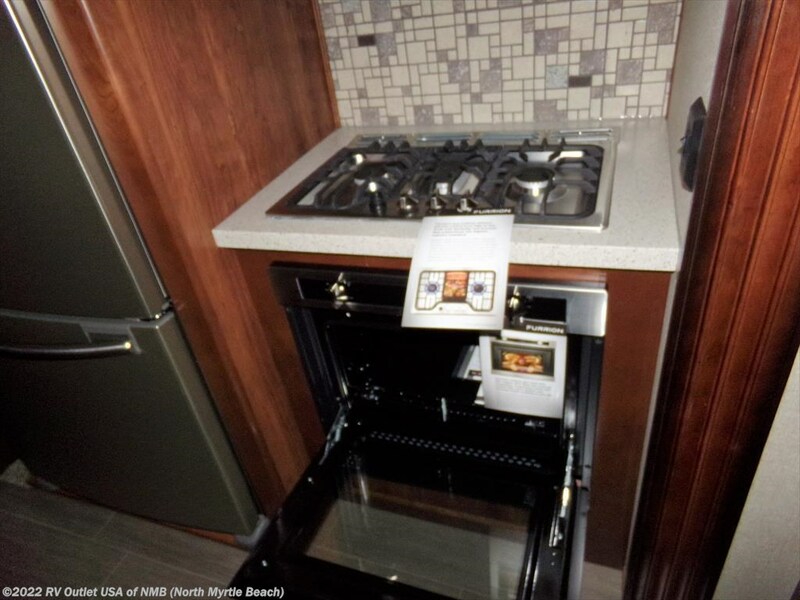 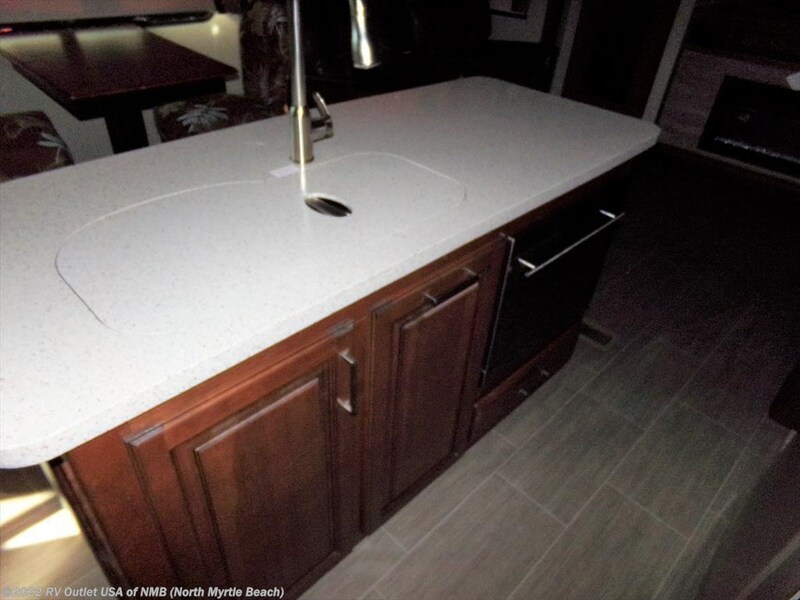 This coach does have a kitchen island with a double sink with underneath cabinets and it has a dinette slide on the door side with a freestanding dinette and (4) chairs. 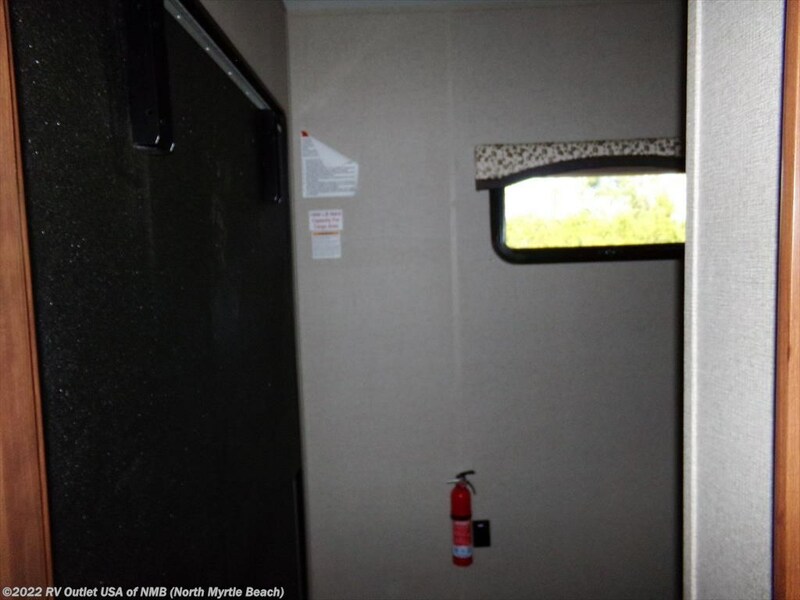 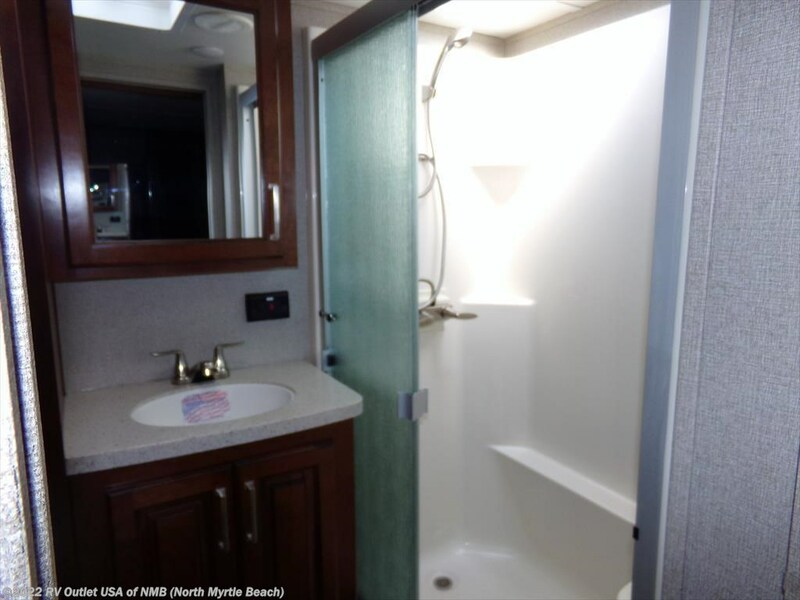 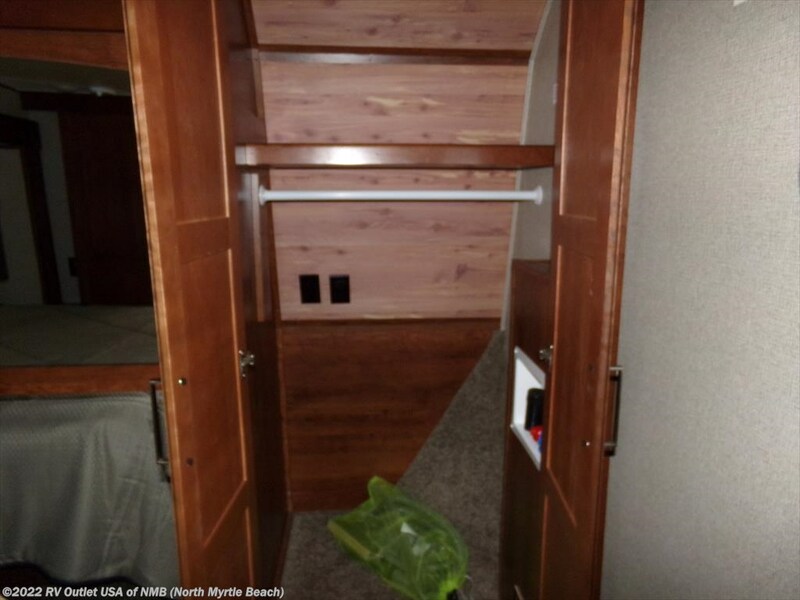 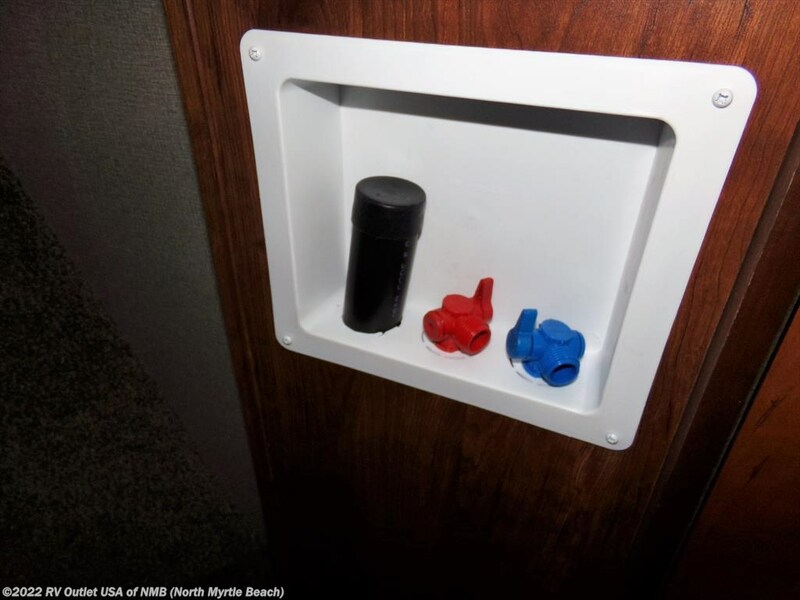 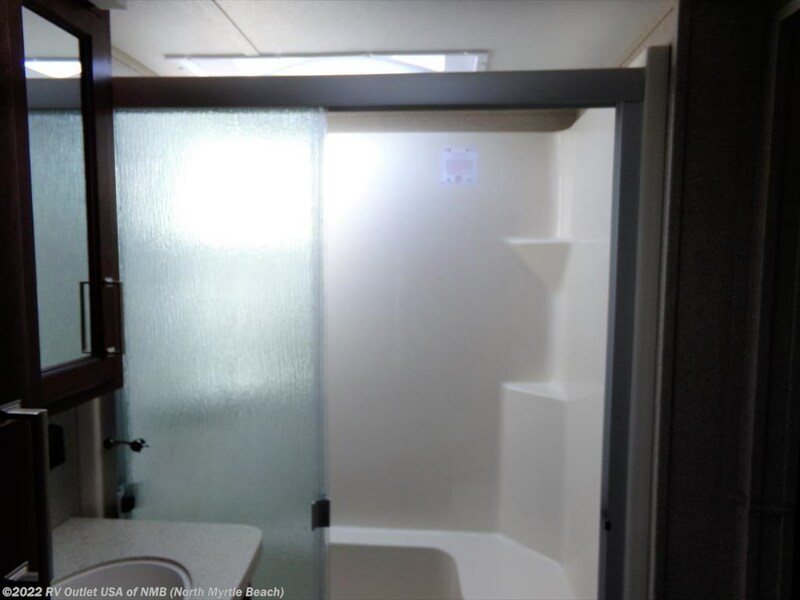 This coach does have a side aisle bathroom with a large adult size shower, a foot flush toilet, sink with underneath storage, and a medicine cabinet. 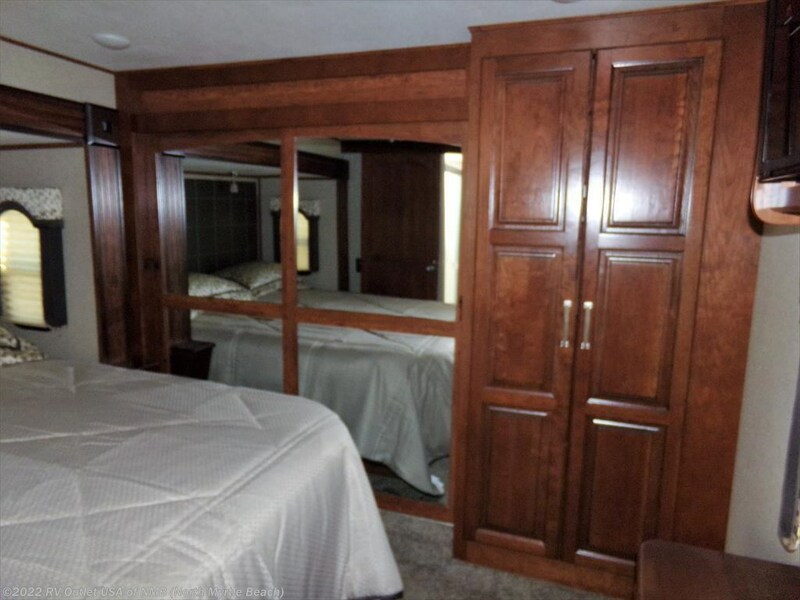 In the front it has a king bed slide on the off door side and at the foot of this bed is a dresser with drawers and wardrobes, and this coach is being prepped for washer and dryer. 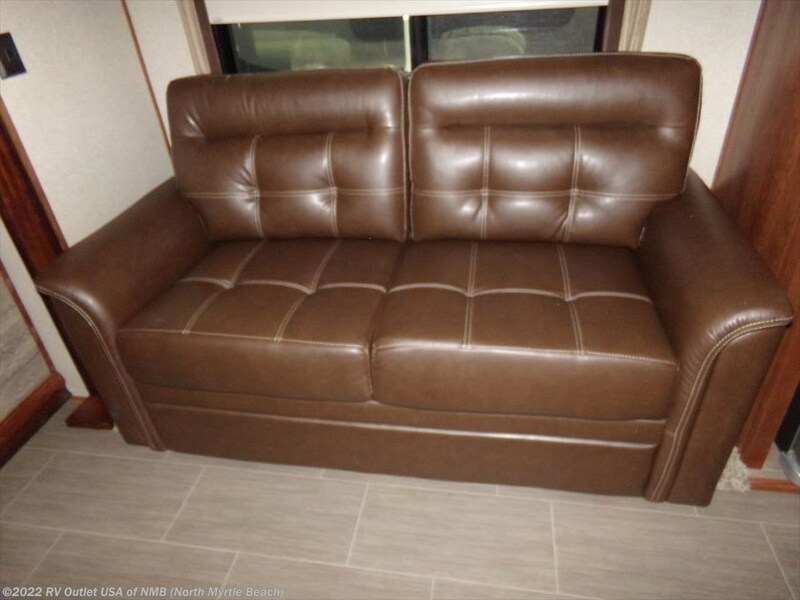 Its a very nice coach with a lot of nice options here’s a list. 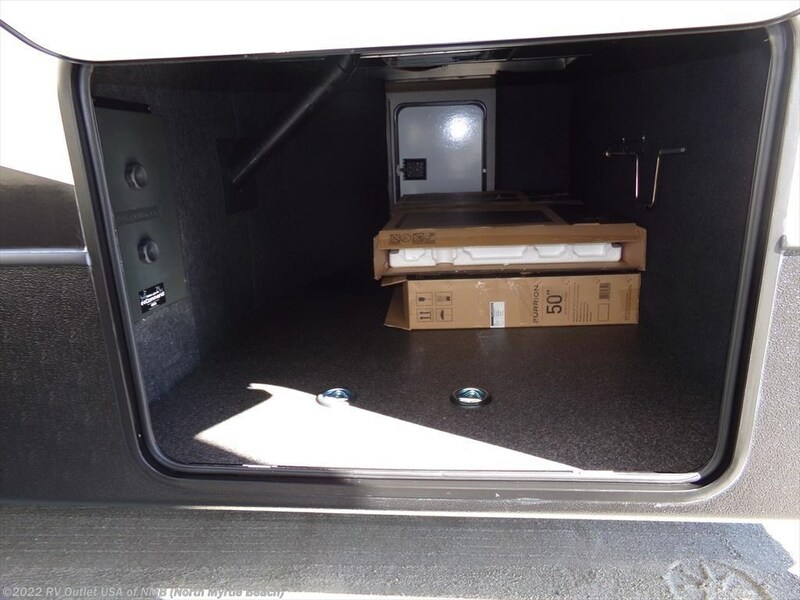 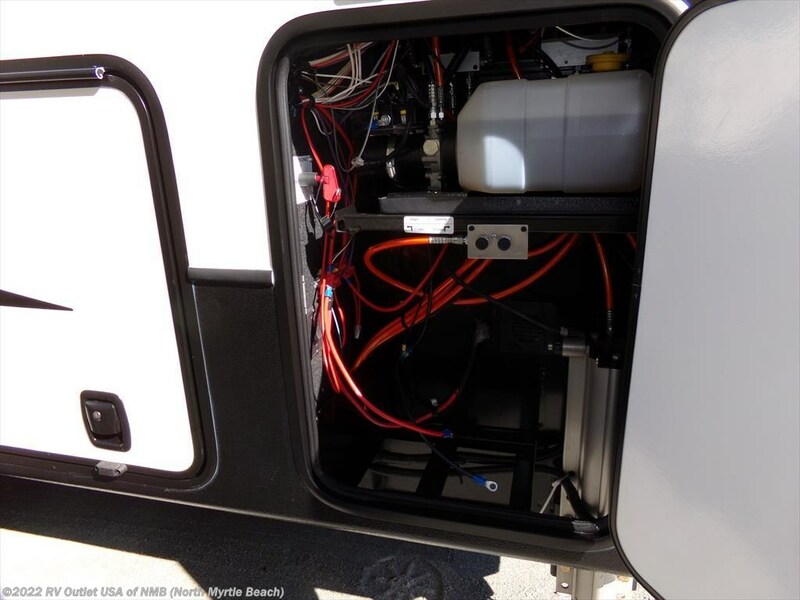 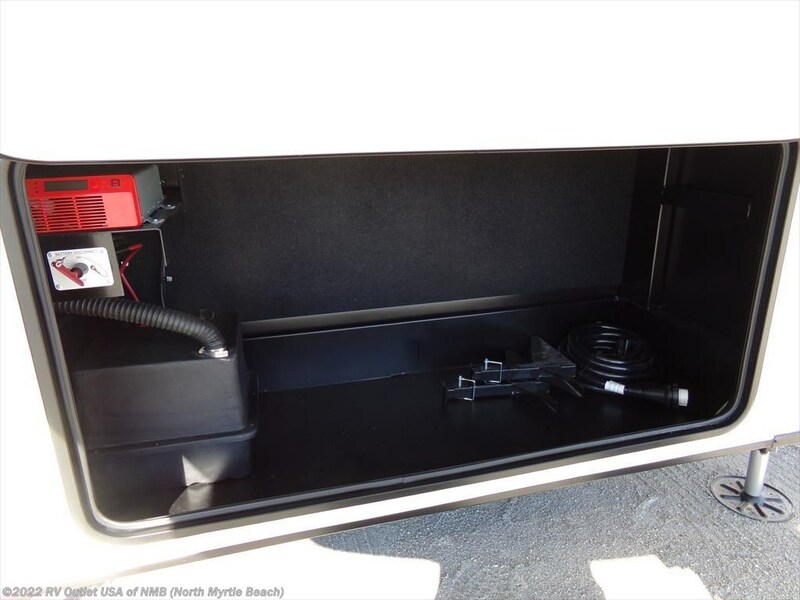 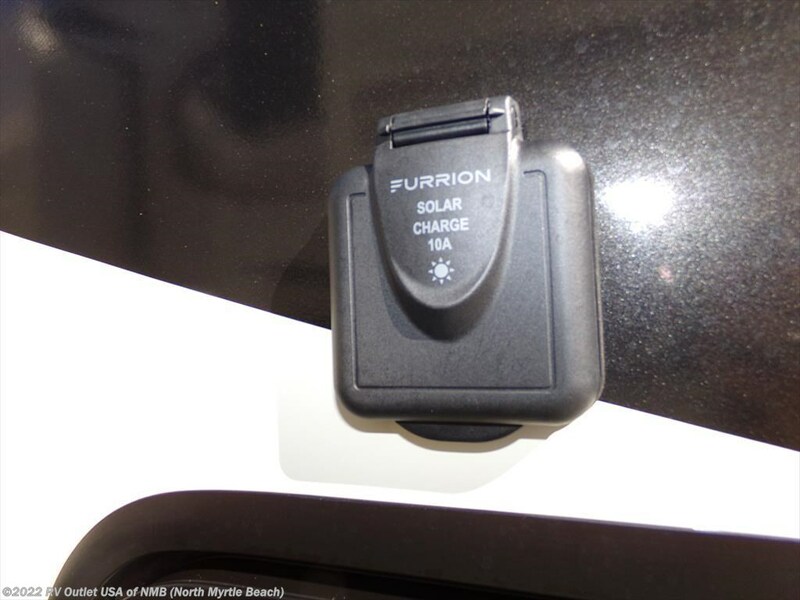 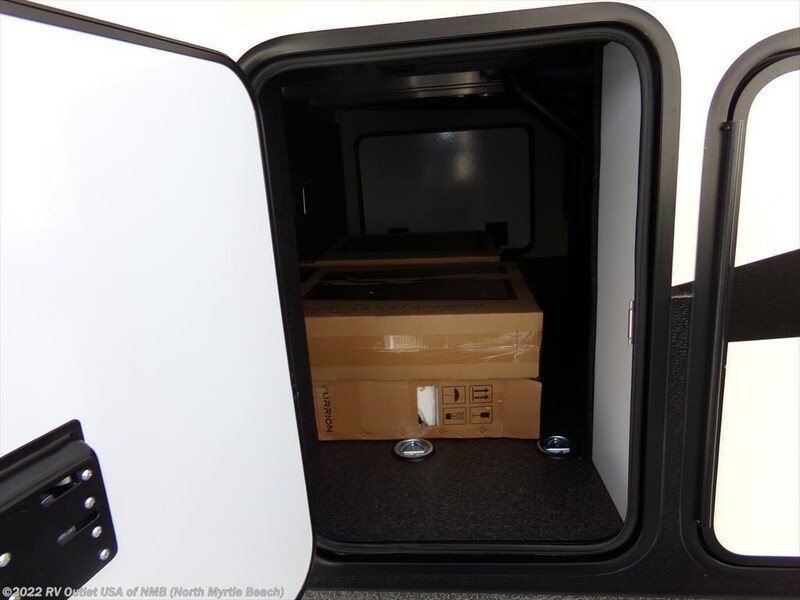 The interior color is Forest Floor, it has the Alps package, a cordless vacuum, it has the new In-Command smart automation system, G rated tires, the 18 cu ft (4) door refrigerator, a Trail Air pin box, the dual 15K whisper quiet air conditioner system with built-in heat pump, and the ever popular six point hydraulic auto leveling system. 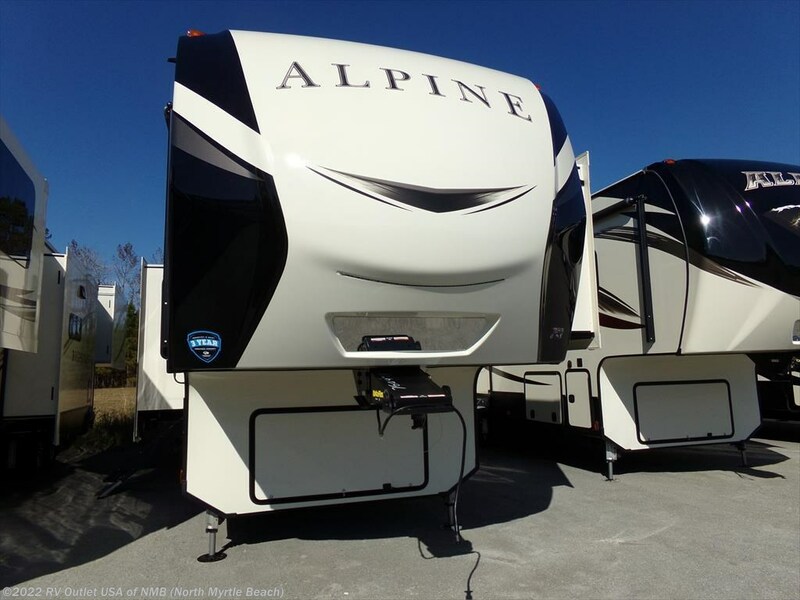 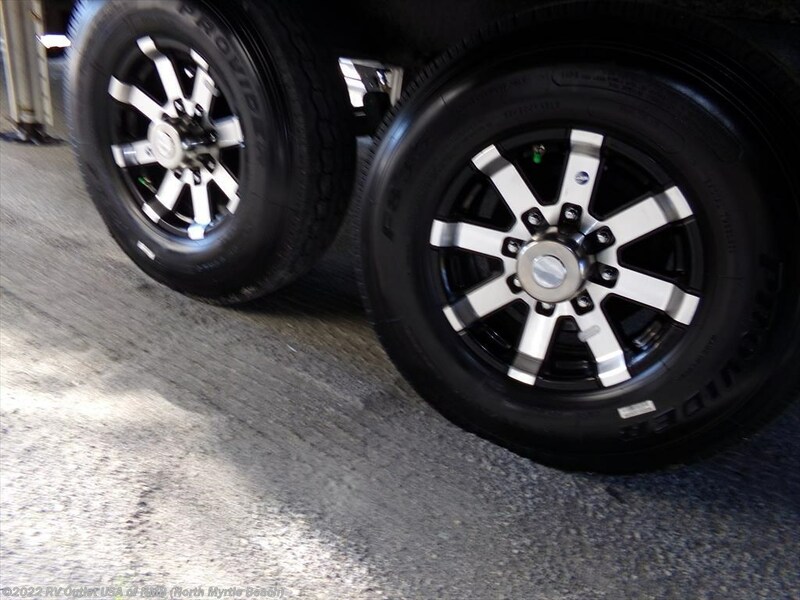 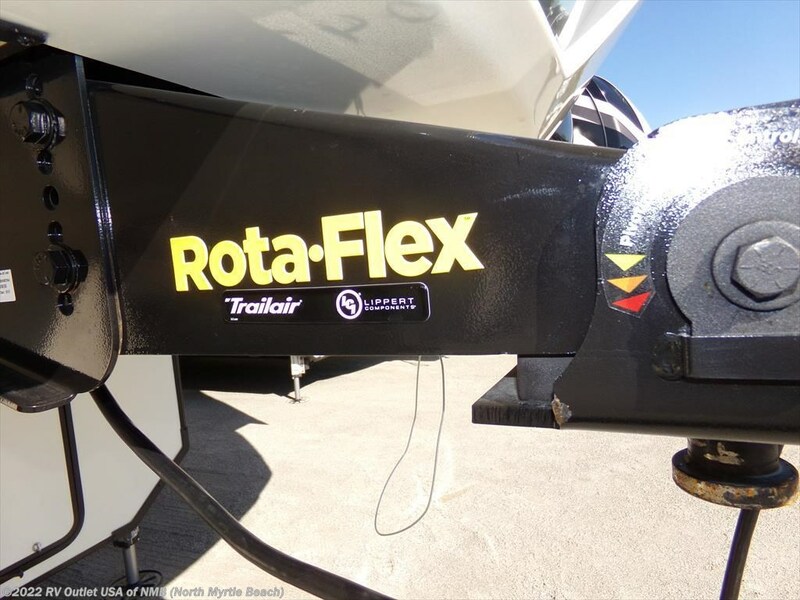 If we can answer any questions, please give us a call at 843-756-2222 and ask for fifth wheel sales. 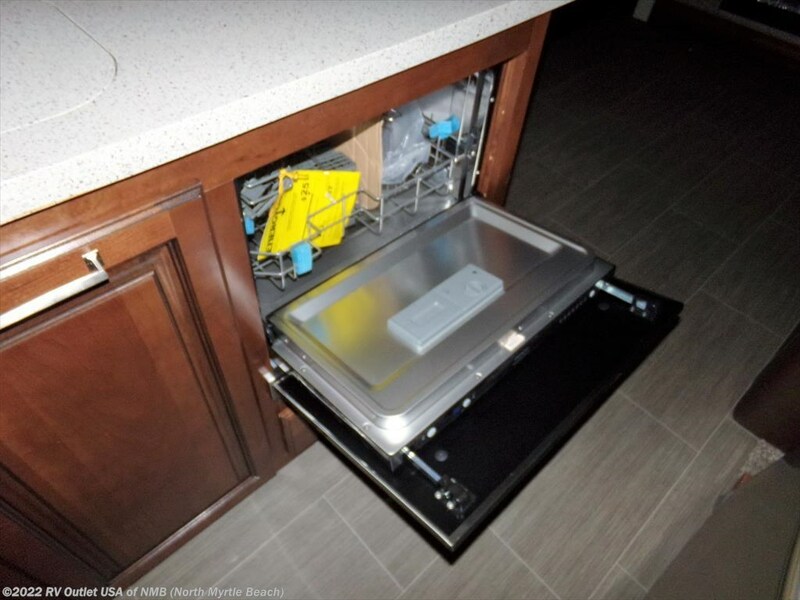 They’ll be more than happy to help you. 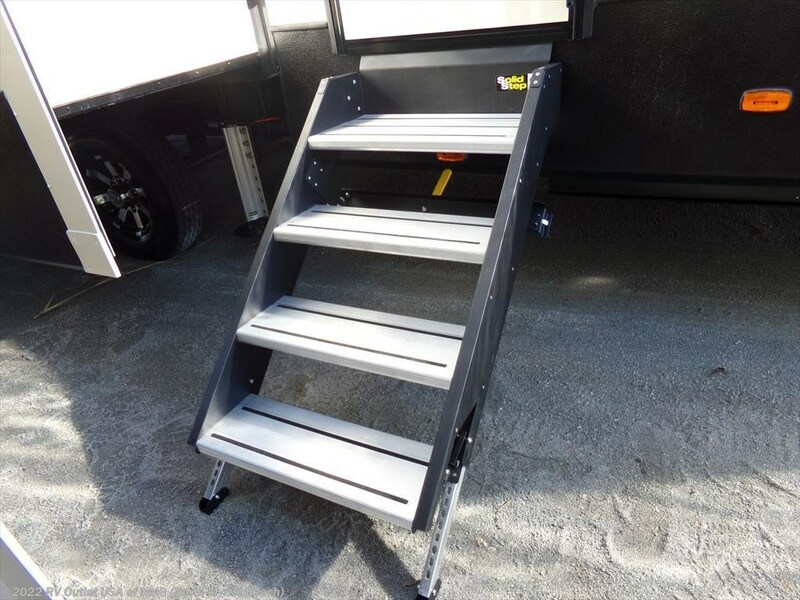 Please keep in mind we have no document or prep fees, and we always offer our customers huge discounts on fifth wheel hitches, installation, parts and accessories.